Anyway do any of you that do a lot of open water/bay sailing have baffles or floatation aids in the hulls of your AIs or TIs? I know the hulls are strong but never say never, would the outriggers be enough to keep a cracked hull afloat long enough to get back to shore? If you do, how did you do it? What did you use? Some guys throw a few pool noodles in their kayak. The nice thing about the TI though, is you have 3 independent chambers, any one of which should prevent the boat from sinking. Hi mate, is that 3 chambers in the main hull or do you mean the hull+outriggers? Ping-pong balls. Fill the hull with ping-pong balls! I'll be looking at some flotation for when I get offshore. With the main hull swamped, for example if a drivewell cracks etc, the TI may well still float, but you sure won't be going anywhere under your own steam. The main hull is a single compartment, so I'll especially be looking for flotation bags fore and aft, and perhaps something around the drivewells etc. It may be a challenge to not interfere with steering lines though. But I want a fighting chance of getting back to land myself. There have been a few instances reported on the forum of people noticing their AI was sluggish, then discovering after landing that the hull was full of water. There never seems to have been a question about them making it home. If I'm not carrying any cargo in the front and rear hatches, I use two sea kayak air bags. Dregsfan, what size do you use and recommend for the AI? Do do you inflate those before leaving shore? I assume you would. Like the proverbial PFD which is never worn, airbags would only truly be effective if checked for leaks and inflated in-place prior to launch. They have a great chance of working then. If you haven't done this, can you imagine bobbing in swells, moving gear around, positioning the floats and blowing them up when the bow 1/2 full of water? How long would you need to straddle the hull, blowing with the front or rear hatches wide open? You might also need to blow hard enough and fast enough to displace 100+ lbs of H2O. That's a great physical stress. I would love to see a large self-inflating model that you could use at sea, but floats are expensive enough as is. As you can tell, I'm more a fan of passive floatation devices. As Cpt-Max says, pool noodles are effective (and a bit more practical than pong-pong balls). A couple noodle layers can be bent neatly into the bow/stern. Pieces can be cut/taped together to form a custom hull liner that helps keep your other gear stowed dry and tight (a nice way to store your anchor). They even come in matching Hobie colors. Yes, pink too. If you have spare PDF's at home, throw them in the hull on every trip. They stuff nicely into any cranny and could save the day - or someone else's life. Guaranteed to work and costs you nothing. As Plastiki proves, sealed empty plastic containers like gallon- sized milk/water jugs will add float to your boat. Those w/ handles can double as floats for your snorkel gear, anchor lines and such. Cut them a bit and they make great bailing devices. (As you can tell, I'm thrifty too). I guess it's time for someone to mention hand pumps and bilge pumps now? Last edited by NOHUHU on Tue Aug 10, 2010 6:00 pm, edited 1 time in total. Not sure what the size is. I think they're around 36-40" long. Any sea kayak float bag will work. This is something Matt should weigh in on. Hobie should have tested this. But if there are any unfortunate "Beta testers" out there, please speak up. In the event of a full hull or a hatch breach I doubt the AI would be sailable on anything but a calm lake. If you could sail the submarine, it would be interesting. The rudder would be underwater half the time and up in the air at others. The bow would plow on any sizable wave and possibly set you up for pitchpole downwind. The mirage drives will still work to some degree but will be under heavy stress. Maybe our Adventurous Aussie friends are willing to try this little test too? I can tell you that if you have a large passenger (or heavy gear) onboard and the AI takes on more than half a hull of water at sea, you will not be going anywhere. At least, not where you intend to go. I have seen this for myself. You will stay afloat though. Thanks to those Amas. But if there are any unfortunate "Beta testers" out there, please speak up. On a trip last year with 3 AI's, over a 12 mile run, when we put the scupper cart under my red AI (yep them troubling red ones) and started to pull it up the boat ramp, it wouldn't budge. Boy I must have been tired. Then, my friend who had been in it grabbed on to help me, and still no go. I opened up the front hatch and it was 80% full of water! The mirage drive well had cracked in the front and the boat had filled with water. We had not noticed much difference in his speed or maneuvering ability before this. So, in my experience, an AI can float and sail just fine with a hull mostly filed with water. Who would have thunk? We had a boat swamping offshore with 2 aboard. I took the passenger on my tramps and the pilot was able to limp the AI to the harbor. 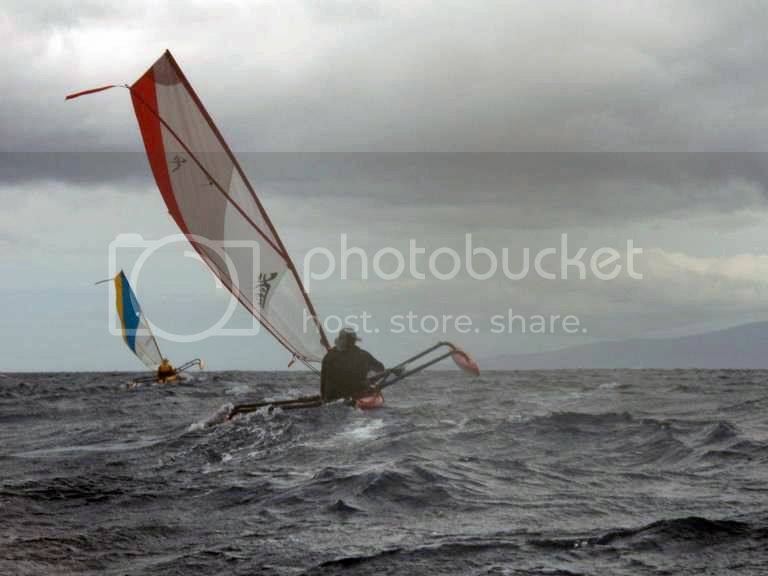 They had a hard time with the rudder in the swells and was lucky there was not pin failure. It was a happy landing, but the AI dragged up on the sand like a beached whale! Cheers for the input, any other great ideas people? Also great to know the Islands can function with pretty serious hull failure, how was the weather with both these incidents? Well, here's one of my favorite pictures from that day. The red AI closest to me is the one that leaked.